Is the best pesticide-free way to repel fleas, ticks, mosquitoes, and other biting insects from your pet. Emitting a pleasant smell for you and your dog, but an unwelcoming repellent to biting insects. Snap the cap off the tip of the tube and lift or spread the hair between the shoulder blades of the dog until you can see the skin. Place the tip on the skin area of the dog and apply the entire amount of the tube. Hold the animal for a few seconds to allow the liquid to absorb. Avoid bathing or submerging your dog in water for 24 hours after application. Apply once a month for continuous protection, or more frequently as needed. Reapply after bathing with soap or shampoo. Apply more frequently if your pet swims often. Avoid contact with eyes or clothing. Wash hands immediately with soap and warm water after dispensing. 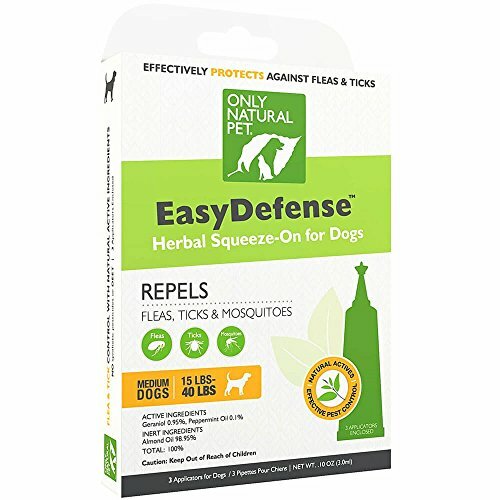 The EasyDefense Herbal Flea & Tick Squeeze-On is designed for flea prevention, not eliminating infestations. If your pet is already infested by fleas, their environment is also infested, and the squeeze-on on its own will not be enough to mitigate the infestation. To eliminate existing flea infestations, we strongly recommend complementing the squeeze-on with other natural flea removal products, most especially the All-in-One Flea Remedy. ONLY NATURAL PET'S FLEA & TICK ADVANCED NATURAL INSECT REPELLANT - Is the best pesticide-free way to repel fleas, ticks, mosquitoes and other biting insects from your dog. Each package lasts 3 months. NATURAL BOTANICALS GERANIOL & PEPPERMINT - Our powerful squeeze-on drops utilize essential oils with active repelling properties that deter fleas, flea eggs, ticks, chewing lice and repels nearly 500 different species of insects. NEVER ANY CHEMICALS - No harmful pesticides making it the safest alternative to dangerous spot-ons and truly the one flea and tick prevention they'll love. Soothing, soluble almond oil is used as a gentle base. Completely safe for pets and humans. MEDIUM BREED FORMULA - Safe for dogs 15 - 40 lbs. Easy Application process. Simply spread the hair between your dog's shoulder blades back until you see skin and apply the entire tube. SATISFACTION GUARANTEE - Only Natural Pet products always include a 100% Satisfaction Guarantee. Only Natural Pet uses only the highest quality ingredients in our products. Providing you & your puppy the highest quality products is our top priority.